StencilGirl Talk: StencilClub Voices Embrace "Maya Love"
StencilClub Voices Embrace "Maya Love"
You are in for a joyful use of color and technique from our StencilClub Voices this month, Christine Slay, Jill McDowell, and Frieda Oxenham! 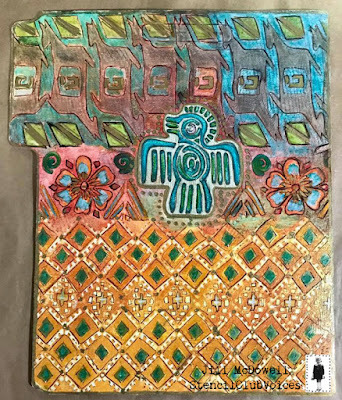 "Shine" was inspired by the desert Southwest were Christine lives and Animism which is the religious belief that objects, places, and creatures all possess a distinct spiritual essence. 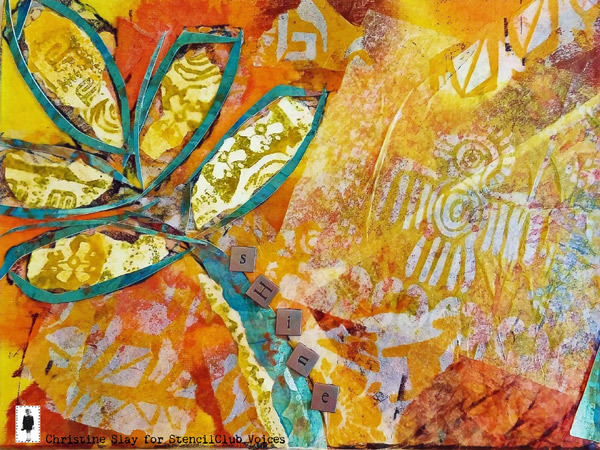 The mixed media canvas has a melted wax base with acrylics and watercolor layered stencils and paper collage on top of stamped tissue paper. 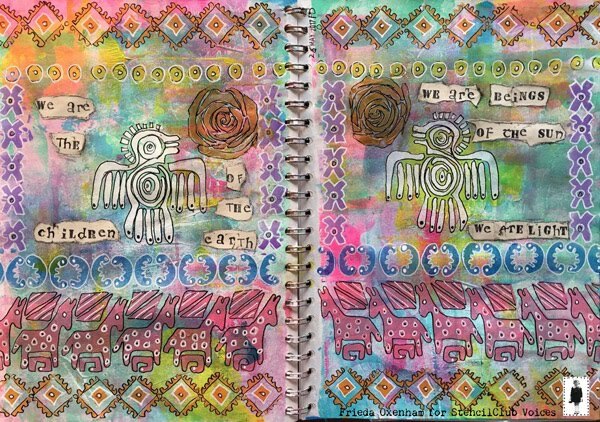 Frieda's art journal spread was painted in an A4 journal and the saying she placed is Mayan. 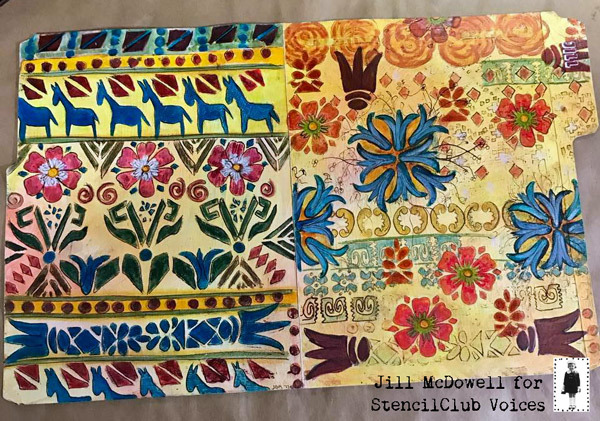 Jill wanted something bright and cheery on her desk so she stenciled her own file folders. 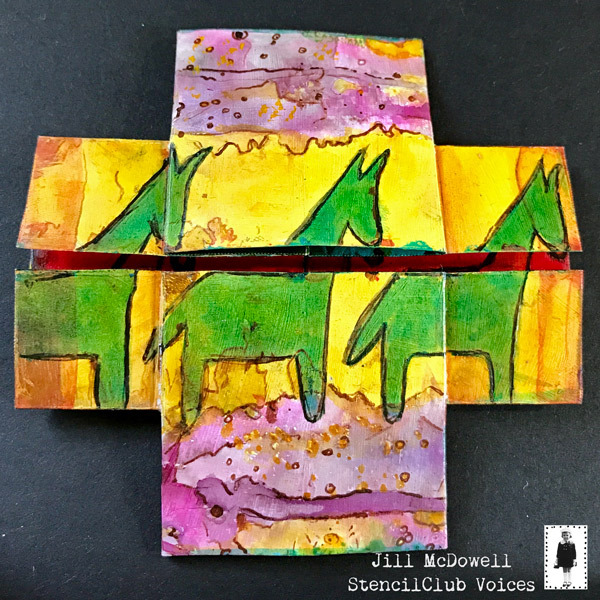 The rainbow palette Jill, Christine, and Frieda used made me want to infuse a card with color using the Maya Love stencils. I always seem to run out of room when I am writing to a friend, so I made this card with extra room! 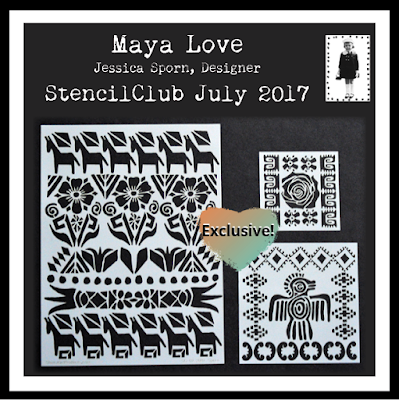 We all look forward to seeing what you make with Jessica Sporn's Maya Love set, exclusively available to StencilClub members. See Jessica's inspiration HERE. Join the club HERE. 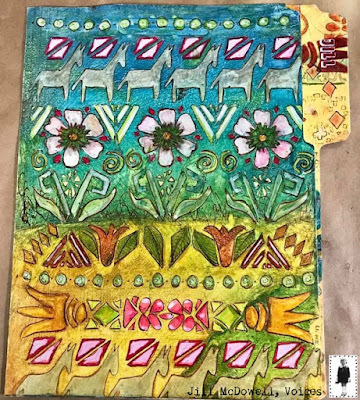 The artwork here, by Christine, Jill and Frieda, is so joyful and detailed. And who wouldn't be delighted to receive a card like the one Carol made. 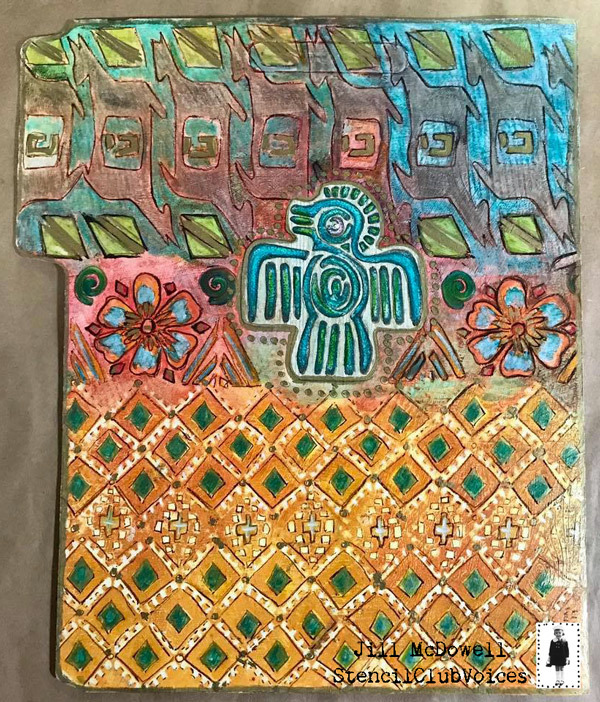 Jessica Sporn is a prolific and talented artist, and her tribute to Mayan culture is truly inspired. I love it all! Thank you! I am blown away by the team's beautiful work - and that infinity card -- I LOVE IT! Thank you for inspiring me! 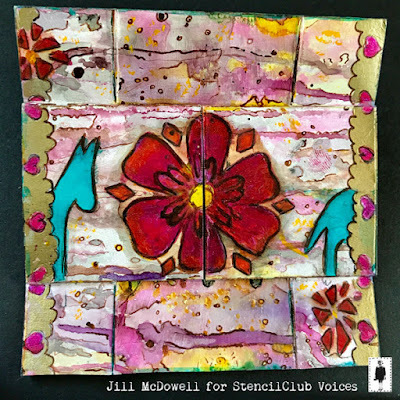 The Jill McDowell video ends abruptly; is there more to it? 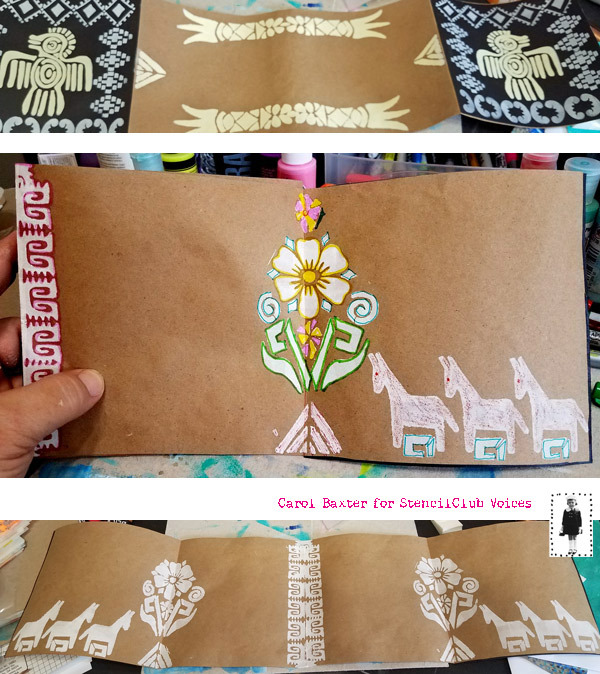 I love this Maya stencil very much, as well as the results. Can I buy the stencil at your shop?